Ranked one of the most highly desirable residential areas in the Central Scottsdale area, Gainey Ranch, Arizona consists of more than 1,000 homes situated along the fairways of the Gainey Ranch Golf Club. Homebuyers have a variety of styles and sizes to choose from, with 19 attractive neighborhoods, and a broad price range starting in the high $200s and reaching more than $2 million. With both condos and single-family homes available in Gainey Ranch, almost anyone can find the home to fit their needs. Nestled in the mountains of the Sonoran Desert, Gainey Ranch offers panoramic views of the McDowell Mountain Range, as well as the beautiful kept surroundings of the Golf Club’s three nine-hole courses. The Lakes, The Dunes, and The Arroyo courses provide members with unparalleled golf opportunities, as well as lessons, leagues and facilities. The pleasant temperatures of this mountain neighborhood also make it possible to enjoy these courses all year round. Although this community is built around the beautiful Gainey Ranch Golf Course, there is much more to the neighborhood than golf. 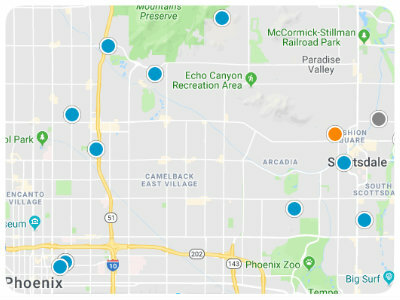 This family-oriented community is placed within easy reach of everything that the city of Scottsdale has to offer, making it a great choice for a variety of lifestyles. Whether you are looking for unique shopping districts, fine dining, or outdoor pursuits like hiking and biking trails, this area caters to all. If you would like to find out more about buying a home in the Gainey Ranch neighborhood of Scottsdale, Arizona, please contact us today!